Taking a few breaths, we had a few moments to compose ourselves before the next tower. From what had happened in the last one, I knew none of us were looking forward to this one, or any of of the others if the Eye wasn't here. Beginning our way up, we wondered why this area of the tunnel seemed so empty; even with the labs still under construction, surely there would be builders or architects wandering around planning the layout...? Instead there was an empty tunnel, void of any life but ourselves, and a few doorways that had been blocked off by tape. Presumably the base for the labs had been shelled out from the stone, but nothing had been installed yet. Additionally there were no guards or checkpoints along this point either, which I thought was particularly odd, especially if there was a chance that an Eye was up in this tower. So far I was under the impression that we were going to be disappointed when we reached the top. "Do you hear any odd noises coming from up ahead?" "Me either... Is that a good thing?" "Yes and no. No Ghasts or pigmen is, but that would suggest that we're not going to find the last Ender Eye up here... Even still, I think we should be prepared this time." We stopped partway up the stairs, and constructed our own rifles quickly before continuing up to the top. As we got there, our rifles were hoisted to arm height, ready to shoot at any Ghast that came too close, but as we stood there, poised ready to attack, we realised that there was no Ghast in this section of the tower. "I don't like this. What if it's round the other side of the column, just waiting for us?" "I doubt they work like that, but we better not take the chance." We began to circle the column, keeping our rifles ready, looking up at the entire height of the tower, but we were unable to find the Ghast that was meant to be here. Reluctantly we lowered our rifles, and began to head up to the next floor, although we doubted we'd be seeing any pigmen either. SERVERE had told us they were likely to put security in the towers that were used to hide the Eyes that HoN Co. had managed to take, but we had assumed they would at least attempt to secure each tower in the same way. Maybe they considered it a waste of resources, or maybe they drastically underestimated our ability to get into the facility. Well they had definitely done that, but it still would have been better to be safe than sorry. "Shush! Can you hear that?" "Two guards, off to the right near to the entrance of the balcony area. They're going to be difficult to get close to so we'll have to use the rifles from here. Aim the barrel between the bars, THEROS you can be the backup shooter in case one of us misses. Although at that distance I doubt it." Climbing back up, we peered through the iron bars; the two guards were stood with their backs to us, however they were both armed. Instead of swords like almost every other guard we had encountered before, but these were actually armed with guns! I had to look again, but holstered at their hips were two sizeable pistols, likely to be a lot more lethal than our dart rifles. Now that I thought about it, none of the guards we had encountered since entering the HQ had swords sheathed, and we hadn't been able to see their hips. It was possible every guard here was armed with a gun or some type. With more pressure being placed on our shots, I aimed for the right-most guard, while UOPETA aimed for the one on the left. I fired first, hitting the guard in the back of the neck, just where I intended, whilst UOPETA's shot hit a little higher, embedding itself into the lower skull of the other guard. They both dropped almost instantly and simultaneously! "Good aim! Now let's secure this floor before heading further up. We don't want to risk running into trouble on the way down. Better check the balcony too..."
Rushing up the last few steps, I went over to the two guards and removed the darts from their unconscious forms, whilst UOPETA and THEROS began to search the area. They quickly returned with no further sign of any more guards on this level, which meant we had a clear run back down provided we weren't being followed by guards behind us. I hadn't seen any CCTV cameras in the tunnel behind us, or in the tower so far, which wasn't surprising if the labs weren't complete yet. "Just the last floor to go and then hopefully we'll find the last Eye and we can get out of here!" With the last staircase to go, and our progress with the tower going surprisingly smoothly, I was worried that at some point something was going to go horribly wrong. I hoped this wasn't the case, but it was likely to manifest in the form of a missing Eye. 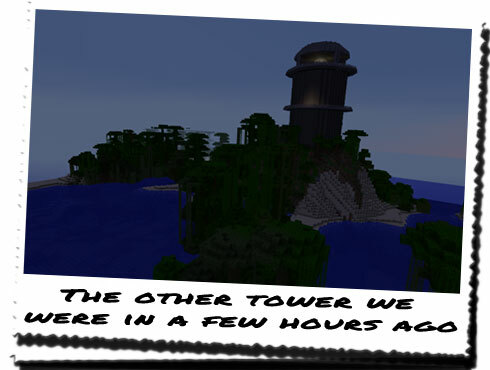 They would have used Ghasts and pigmen to guard this tower otherwise, much like the first one. As we neared the top, we could see that it was getting dark outside, as the light level changed drastically. We couldn't hear anyone, and as we got to the top level we couldn't see anyone either. Not taking any chances, we checked the entire top floor, checking around the far side if the column, but unlike the first tower, there was no chest. "Well looks like we lucked out... There's no Eye of Ender here." "I suppose we had better head back. We've still got three more towers to search..."